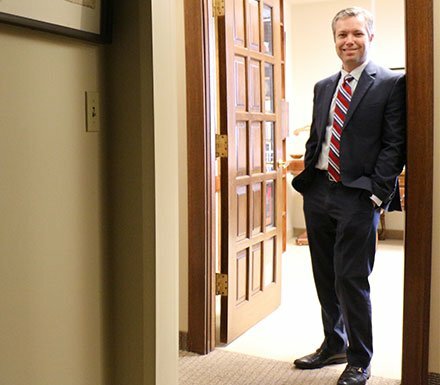 Get to Know Attorney Matt Miller | Miller Law Offices, P.C. While some kids grow up with a specific career path in mind, I fell on the opposite end of the spectrum. All I knew for sure was that I wanted to help people. That’s why, after graduating from high school, I decided it was time to leave Chillicothe and enlist in the Navy. I knew that serving my country would not only help to shape my own future, but it would also be an incredible opportunity to help others. As it turned out, my four-year enlistment ended up giving me even more than I had expected. On top of getting to help people, the experience gave me purpose, taught me discipline, and made me an even harder worker than I already was. It also instilled in me a strong sense of integrity, tenacity, and persistence. It’s those qualities, I think, that paved the way toward a career in law. During law school, I found I was particularly fascinated by the criminal justice system. It’s no wonder that I jumped at the chance to work as a student attorney at the Peoria County State’s Attorney’s Office and later, the Northern Illinois College of Law Criminal Defense Clinic. Between those two roles, I completed my first jury trial and got to defend impoverished clients under the supervision of a licensed attorney. I see each case as an opportunity to positively impact someone’s life. Straight out of law school, I discovered that I had a real knack for criminal prosecution. In my first role as a licensed attorney, I went from prosecuting traffic-related cases to misdemeanors in just three months. Generally, that kind of promotion isn’t available until you have at least 9 months of practice under your belt. In 2008, my business partner and I decided to open our own law firm. It was then that I switched from prosecuting to defending the criminally accused. In 2014, I struck out on my own and founded Miller Law Offices, P.C. While criminal defense is still central to my practice, I have also become a go-to resource for many Peoria families on other legal matters. For instance, I have helped countless locals get through their divorces, establish child custody arrangements, and obtain orders of protection (in cases of domestic violence). Like criminal defense, family law cases require both creative legal insight and a genuine investment in the well-being of others. I’m all too happy to provide those things to my clients, regardless of whether they’ve been accused of a crime or are struggling with a family law issue. When I’m not working on a case, I spend every moment I can with my four kids. I also work hard to keep up with them by staying active. In particular, I enjoy running, rock climbing, and practicing Brazilian Jiu Jitsu.